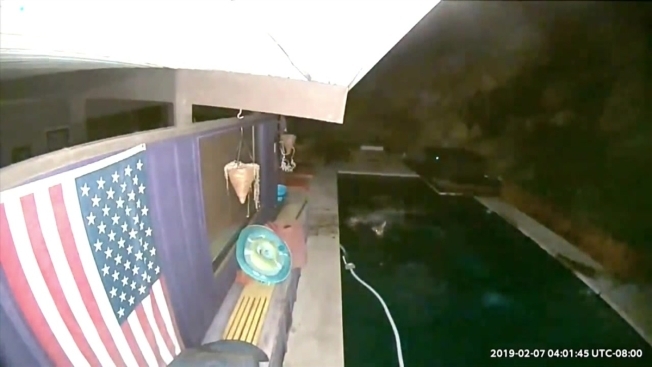 When a Glendale couple noticed water around the edges of their backyard pool, they suspected something fell in overnight. They were surprised by the wild scene captured at 4 a.m. by their security camera. A determined mountain lion and the deer it was hunting can be seen bolting from the brush behind the Wongs' home, splashing into the pool in a test of survival of the fittest. Just another night in Southern California's urban wilderness. "We had a bobcat last week, during the summer we have rattle snakes -- you just kind of get used to it I guess," said Wong. The mountain lion quickly climbed out, apparently wanting nothing to do with this unfamiliar water source. The deer paddled around, before lifting itself over the edge. They were captured moments later on another camera at the house, which is near the Verdugo Mountains north of Los Angeles. That was the last Wong, an elementary school teacher who shared the video with her students, saw of them. "We all made guesses about what happened at the end," said Wong. "Most said the deer got away, but I don't think that's what happened." The big cat is likely Nikita, an untagged female who might be the only mountain lion roaming the Verdugo Mountains. She's used to finding her way around streams, lakes and rivers, but a backyard pool was probably a strange experience for her, said the National Wildlife Society's Beth Pratt Bergstom. The mountain lion population is high in California, relative to other parts of the United States. Density estimates vary, but the figure might be as high as 10 lions per 100 square miles. By that estimate, the population is somewhere between 4,000 to 6,000 mountain lions statewide. But it's difficult to say whether that population is increasing or decreasing without an ongoing statewide study. Mountain lions go where they can find food, primarily deer. That sometimes brings them into urban areas, but it should be noted that a person is 1,000 times more likely to be struck by lightning than attacked by a mountain lion, according to the California Department of Fish and Wildlife. There have been only 16 verified mountain lion attacks in California since 1890, six of which were fatal, according to the agency. The department receives hundreds of reports each year about mountain lions killing pets and livestock. Mountain lions are a specially protected species in California under the California Wildlife Protection Act of 1990, approved as Prop 117 by California voters. The classification has nothing to do with mountain lion numbers in California, but its passage made it illegal to hunt the big cats.